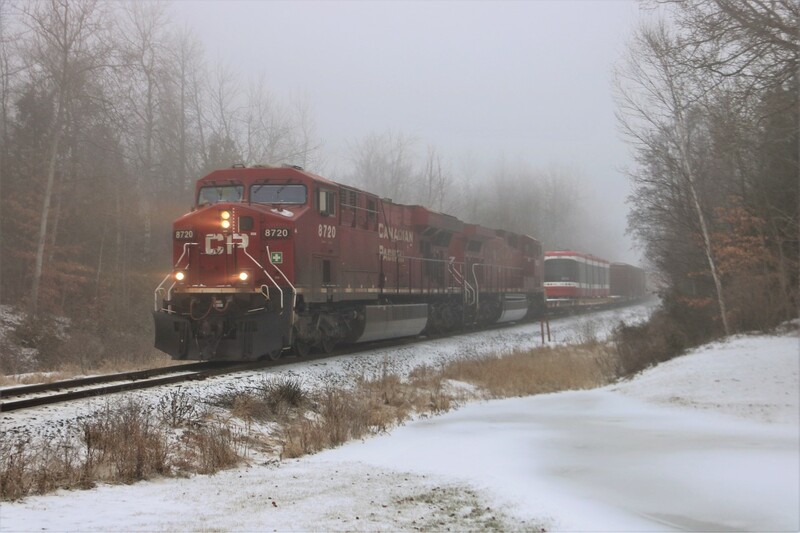 Railpictures.ca - BPurdy Photo: Out of the fog and freezing drizzle comes CP 246 headed south with CP 8720 and CP 9537 for power hauling a special car with TTC streetcar 4478 along for the ride where it will be dropped of in Welland. | Railpictures.ca – Canadian Railway Photography – photographie ferroviaire Canadienne. Caption: Out of the fog and freezing drizzle comes CP 246 headed south with CP 8720 and CP 9537 for power hauling a special car with TTC streetcar 4478 along for the ride where it will be dropped of in Welland. I believe it’s this unit being sent for re-work/refurbishment due to the above incident.